The history of philosophy tends to get mightily abbreviated. The few philosophy professors I know don’t have much truck with generalist “history of ideas”-type projects, and the discipline itself encourages, nay, requires, intensive specialization. Add to this glib comments like Alfred North Whitehead’s on philosophy as a “series of footnotes to Plato,” and the eminent position of the erratic and comparatively philosophically-unschooled autodidact Wittgenstein, and you have, in modern philosophy, a sad neglect of the genealogy of thought. But take heart, you who, like me, incline toward minor figures and obscure relationships. Ohio State professor of philosophy Kevin Scharp is a Linnaean taxonomist of thought, compiling charts, “Information Boxes,” and hand-drawn diagrams of the “Sociology of Philosophy,” like that above, which covers Western philosophy from 600 B.C.E. to 600 C.E. 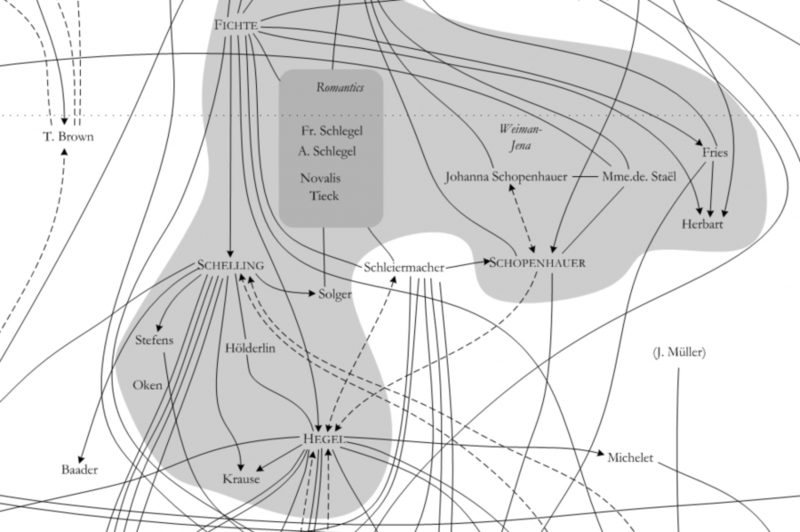 and shows the myriad complex connections between hundreds of individual philosophers and schools of thought (such as Stoicism, Skepticism, Neo-Platonism, etc.). The second massive diagram covers 600 C.E. to about 1935. Each one is about 4 feet wide and 44 feet tall, with the text at 12-pont font. Both diagrams are based on Sociology of Philosophies by Randall Collins. Note: to see the diagrams in detail, you will need to click the links above, and then click again on the images that appear on the new web page. You’d guess from this that no one outside of Europe ever thought about the big questions in a systematic way. They did and do. Wonderful! But I was slightly bothered by the fact that this article referred to the diagram as a history of philosophy when in fact it was a history only of “Western” philosophy (A fact that the artist remembered, the file name clearly says so). The Hindu, Buddhist & Chinese schools of philosophy are as old and as rich as classical western schools and this is something western audiences are mostly oblivious to while discussing philosophy. @Jayarava and Unnikrishnan: yes, you’re both absolutely right. I should have made clear (as Professor Scharp does) that these diagrams are strictly maps of Western Philosophy, and do not touch on the rich traditions of the many, many Eastern schools. The world “philosophy”, being Greek, obviously applies to the Greek tradition and its ancestors. Likewise, calling something like the Indian Vedas “philosophy” lumps a unique and distinct thread of cultural tradition in with our Western traditions of syllogistic argument, and especially the neo-Platonic discourses that have until recently dominated what we call “philosophy”. Applying this Hellenic appellation to distinct cultural traditions is not only tedious pedantry, it is also an expression of the unconscious paternalism that the modern PC freak is so desperate to avoid. No, the concept of “Eastern philosophy” is just fine, despite the Greek origin of the word “philosophy.” It doesn’t make anyone intelligent think that the thought traditions referred to have to conform to “Western traditions of syllogistic argument” or the like. Thank you very much for these excellent visualisations! May I only make a remark on a technicality: JPEG is not a suitable format for such a vector-based diagram. If the software you are using provides a PDF export (or print as PDF on a MAC) this would be very helpful. Even PNG would be better than JPEG as it does not blur sharp lines (i.e. text). You can have systematic thought which is not philosophical in nature. You can have philosophy in the East, but what we refer to as “Eastern philosophy” isn’t philosophy in a strict sense. It is, it seems, systematic thought, however not all systematic thought is philosophy, and I am unaware of any history of philosophical thought outside of Europe and America prior to 1950. This is because intrinsic to the notion of philosophy is the ability to converse freely with other philosophers, as well as a belief in the universality of reason. Thus, democracy, or at the very least, republicanism, is a pre-condition of philosophy. Most states did not have this type of freedom except in very rare cases, and this prevented Greek style philosophy from fully developing. While the Middle East had a proto-philosophy or pseudo-philosophy, which influenced Western thinkers and philosophers during the European dark ages (where Europe had thinkers, and scribes, but not philosophers), it does not fully qualify as philosophy because the thinkers did not believe in the universality of reason. They believed it was limited to only those who spoke Arabic. The Greek philosophers believed that reason was available to all as this was a thought brought to them through Aristotle (Arguably one of the first philosophers in this strict sense). The Chinese had a very advanced system of systematic thought, but it is difficult to classify this as philosophy because of it’s reliance on superstition and the politics which made it such that there was no freedom of the transmission of ideas outside the hegemony. And while we can refer to systematic thinking as “philosophy” The difference between Western philosophy, which can happen anywhere, and the fact that these conditions of Western philosophy rarely, if ever, happens outside of European cultures, is a concern to those who have an interest in cultural inclusion and the Western idea of universality, which begs the question “Why not?” And since historically these answers have been linked to racism, although racism goes against the basic ideals of philosophy, it has become a near taboo subject in today’s discourse. Socratics were mostly systematic thinkers not unlike systematic thinkers that happen most anywhere else in the world (with some notable exceptions), but what Socrates taught was quite different from the norms of thinking, introducing doubt and critical reasoning, and eventually he was put to death for his teachings when the state’s regime changed and his teachings went against their moral principles (You cannot doubt them! This is why philosophy is so rare!). But philosophy in this strict sense, thankfully, lived on in his students for several hundred years, insulated by, and thus, partly contained by the state. After it’s death, it was reborn several times. Perhaps first under Charlemagne, then later in the petit renaissance in 12th century France. And again as the Italian Renaissance, which was extended into the Enlightenment, which spread and is arguably still around to some extent (although, postmodernism might be an acknowledgment of a recent death), which we take for granted, and is now under constant check as authoritarian practices and severe social pressures of conformity under cultural norms (such as the one which states there must have been an historical philosophy outside of Europe because there are bright systematic thinkers everywhere) are threatening the political environment which allows for philosophical discourse. No way for me to correct errors? ‘Aristotle’ is supposed to read ‘Archimedes’. This is superb, but where can I find the diagram from 600AD-1935? When I read the headline about two charts, I assumed it would be one for western philosophy and one for eastern philosophy. But alas, the sad ignorance of eastern philosophy in the west continues. There is far deeper philosophical insight, subtlety, complexity and sophistication to be found in the philosophies associated with Buddhism, Hinduism and Taoism than one will ever find in western philosophy. I completely endorse Donna’s argument. It is time that non occidental, non anglo-saxon, non Eurocentric revisions of what is termed ‘Philosophy’ see the light of day. The darkness of narrow, blinkered approaches to the history of ideas must come to an end. Mark: You give no real reason for excluding eastern philosophy from the domain of ‘philosophy’ – other than the fact that it’s not like western philosophy. This is rather like excluding Asians from the category of ‘people’ because they’re different from Europeans. The original meaning of ‘philosophy’ – “love of wisdom” – says nothing at all about the Socratic method, and certainly nothing about Aristotle. Indeed, the pre-socratic philosophers of ancient Greece had much in common with eastern philosophy. This tendency of modern physics – relativity, quantum mechanics and chaos theory – to undermine the cherished notions of recent western philosophy while giving credence to eastern philosophy may be one reason why philosophers in the west seem disinclined to take modern physics seriously; even though it has been amply confirmed by experiment for over 100 years now. Instead, philosophers in the west seem to cling desperately to the obsolete physical theories of Newton and Descartes, and often seem determined to resurrect Determinism via fringe physics ideas like those of David Bohm. The real irony is that in their mad embrace of ontological materialism, philosphers imagine that they’re adhering to what is most compatible with science; but science has no proof of materialism and does not even depend on it. If philosophers were willing to embrace what is now known in physics, then it might well lead them right into the patiently waiting arms of eastern philosophy. Perhaps that is just what they fear. Perhaps the reason why eastern philosophy is excluded from ‘philosophy’ in universities is the same reason why western philosophers seem determined to avoid or evade modern physics. Because if they took it seriously, a whole lot of western philosophy would start to crumble. The Western philosophers are open to develop and challenge ideas. History of philosophy and science shows that constant reinvention and openness of the Westerners. As a person interested and with background in both philosophy and psychology, my opinion is, that Westerners are least defensive when talking about themselves and/or their culture. Also, Western universities are open to study diverse religions not only Christianity, even if the West was built on Greek philosophy and Iudeo-Christianity. Those obsolete physical theories enabled the development of science and technology that almost all of us are using, and enabled the survival and feeding of billions around the world. Sometimes when we “see” (Eastern religions believe it is illusion), lets say fear in others, might be the projection of our own fear. @Mark: thank you for the “tour the force” that clarified relevant aspects of the topic! I would like to make an observation: I grew up learning about the “Dark Middle Age”, then I met a few professors who disagreed that. One of them, Alex Baumgarten studies/teaches the Middle Age and wrote several books (despite his young age), on St. Anselm of Canterbury, St. Thomas D’Aquino, Albertus Magnus, Bonaventura, etc. He talks about a “coup d’image” performed by Voltaire, Diderot, even D’Alambert, on the Middle Age, considering it dark. The image was partially retouched by another French, namely Pierre Duhem. The Middle Age was not homogenous, it gave us the Renaissance – which can hardly be considered dark, also it was the cradle for modernity with a lot of intellectual effervescence. @Donna: what we now know in physics” is no reason to abandon materialism or western philosophy for eastern mysticisms or religious traditions. If you studied philosophy, then you should known that western philosophers do not typically “embrace” metaphysical doctrines such as ontological materialism. Commitment to metaphysical doctrines is typically minimal, because, unlike mysticists, philosophers love justifiable wisdom. Wonderful, but you have misread AN Whitehead’s popular quote about Plato. It is hyperbole, employed to underline the centrality of Plato in Western philosophy. Whitehead was aware, obviously, of the enormous variety of thought in the history of ideas. And speaking of Whitehead, it’s curious how the diagram (and so many theorists of the Analytical faith) are so intent on leaving out the radicalizing influence of Bergson, helping Whitehead move out of the essentializing static tradition of philosophy into process. It’s unfortunate that so many have taken the side of Russell in divorcing Whitehead once he put his own theory into motion. strictly speaking, it has limited linkage to EASTERN WISDOM. The word, philosophy has its origin rooted in the west so lets leave it as a field of western studies. Any way to print this like on 32 pages? I don’t need 12pt font at 44 ft! the erratic and comparatively philosophically-unschooled autodidact Wittgenstein? Great work! This mapping is only up to Medieval epoch. Is there any opportunity to find the whole picture? P.S. To critical comments: systematic thought required for explanation. You cannot comprehend many things or will not be able without systematical comparison. Do not shoot the pianist, he is doing his best!